Advances in Enzymology and Related Areas of Molecular Biology is a seminal series in the field of biochemistry, offering researchers access to authoritative reviews of the latest discoveries in all areas of enzymology and molecular biology. These landmark volumes date back to 1941, providing an unrivaled view of the historical development of enzymology. The series offers researchers the latest understanding of enzymes, their mechanisms, reactions and evolution, roles in complex biological process, and their application in both the laboratory and industry. Each volume in the series features contributions by leading pioneers and investigators in the field from around the world. All articles are carefully edited to ensure thoroughness, quality, and readability. 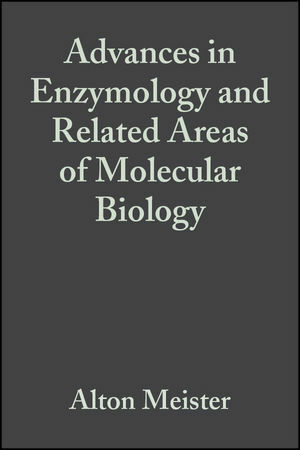 With its wide range of topics and long historical pedigree, Advances in Enzymology and Related Areas of Molecular Biology can be used not only by students and researchers in molecular biology, biochemistry, and enzymology, but also by any scientist interested in the discovery of an enzyme, its properties, and its applications. Alton Meister was an American biochemist who made pioneering contributions to the study of glutathionemetabolism. He was born in New York, received an undergraduate degree from Harvard University and an MD from Cornell University Medical College. He then moved to the National Cancer Institute at the National Institutes of Health in Bethesda, Maryland. He remained there until 1955 when he became Chairman of the Department of Biochemistry at Tufts University.